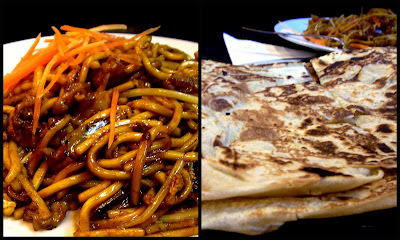 Malaysian food is one of my favourites, but I rarely eat it anymore. Having returned to Wellington from Southeast Asia, I suppose I've been afraid of disappointment after gorging myself on so many creamy-spicy bowls of laksa and fluffy, chewy, cooked-to-order roti. But it's been almost a year since I flew home from Singapore and my warm memories of Malaysian food are starting turn into piercingly real hunger pangs. So last weekend I got off my high horse and into Satay Village on Ghuznee St.
Years ago, Satay Village was my Malaysian restaurant of choice. Cheap, fast, satisfyingly greasy (but not gut-wrenchingly so), and to my inexperienced palate, delicious. So, how would it hold up now that I've returned? E and I were given menus and seated, and moments later two glasses of water appeared on our table. The menu doesn't go beyond the basics: laksa, mee goreng, roti chanai, beef rendang, and so on. The moment we decided what we were having, a waitress appeared magically at our table: "You ready to order?" Not overly friendly, but definitely efficient. And not long after we ordered, our food started to arrive. We had chicken satay ($6 for 4 sticks) which came with a little saucer of peanut sauce. The chicken was nicely charred on the outside, and not too dry: the texture was dead on. But I felt as though both the sauce and the chicken itself could have done with a bit more seasoning. Still, these were satisfying. The real test, for me, was the curry laksa ($8) and the roti ($2.50). To put it lightly, I was obsessed with laksa whilst living in Singapore... I'd have it for breakfast, lunch and dinner if there weren't so many other foods to try! So, I had to see how Satay Village's laksa stacked up. The roti was not nearly as good. Admittedly I have developed somewhat snobbish tastes when it comes to roti in that I prefer the freshly made: flaky, fluffy, somewhat stretchy. These tasted like they had been reheated (though the crispiness of the edges suggested they hadn't been microwaved): while still chewy enough, they were a little dense and definitely not fluffy or stretchy. E ordered the chicken mee goreng ($9), a heap of fried egg noodles and chicken dumped unceremoniously on a plate with a smattering of shredded carrots as a garnish. While not the most attractive, it was as good as I remembered: kind of greasy but full of flavour. All up, my return to Satay Village was a mixed bag, but I think I'll be back. Great value for money, acceptable food, brisk yet satisfactory service. Next time, though, I'll definitely be ordering my laksa "extra hot". I often walk past this place and wonder what it's like. 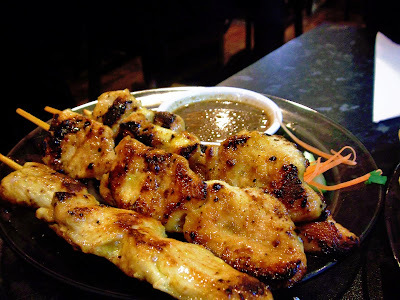 Might have to check it out, the chicken satay skewers look really good. I know what you mean about the roti though, once you've had a really good one it's hard not to measure everything else against it.